Top: (left) Larry Silverstein, addressing the attendees. (center) Erez Vigodman (left), with Izzy Tapoohi, Israel Bonds President & CEO. (right) John Liu, NYC Comptroller, addressing the participants. Center row: (left) From left: Izzy Tapoohi, Israel Bonds' President & CEO; Larry Silverstein; Tom DiNapoli, NYS Comptroller; and Israel Bonds sales director, Stuart Garawitz. (right) Izzy Tapoohi, Israel Bonds President & CEO (left) and John Liu, NYC Comptroller. Bottom photos: Loyal supporters of Israel Bonds Real Estate New Leadership. Israel Bonds Real Estate New Leadership sponsored an authoritative account of how a major Israeli company has successfully partnered with Chinese investors and flourished. At the event at 7 World Trade Center, builder and developer Larry Silverstein welcomed the more than 200 young men and women professionals and told them of the incredible accomplishment of rebuilding the iconic site in the aftermath of the 9/11 terrorist attack. Erez Vigodman, the director of the huge Israeli fertilizer and agricultural nutrients manufacturer Makteshim-Agan, fascinated the audience with his account of how the Israeli concern has succeeded enormously by understanding the intricacies of the international market and, in particular, the characteristics of Chinese financing and marketing. "You have to have an open mind and be willing to defy dogma," Vigodman said, "in order to understand the challenges and pitfalls of such a gigantic undertaking." The special advantage of the Israeli manufacturer is the quality of their agricultural products, which serve to help alleviate the world food shortage. 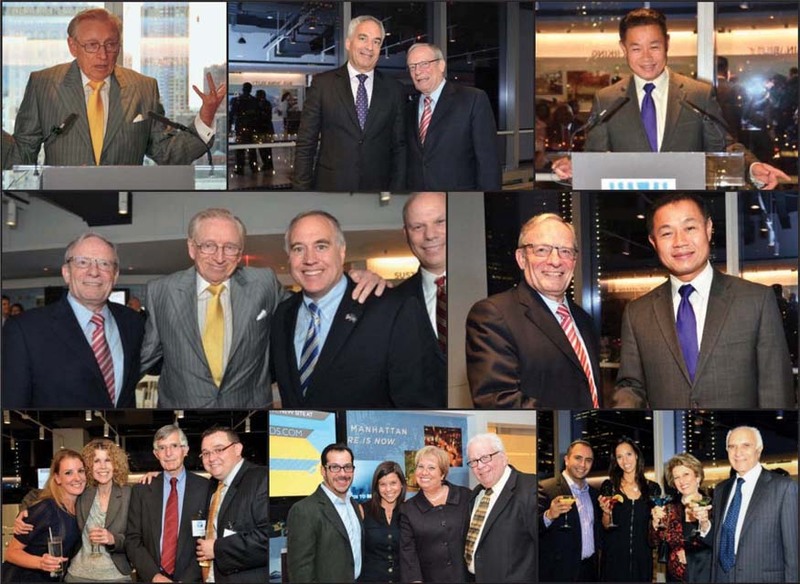 Larry Silverstein, who owns the World Trade Center property and is overseeing the rebuilding of the complex was the perfect host for an evening that offered an exclusive window into Israel's business sector, which continues to generate global interest. Silverstein told the 200 participants at the event that the restoration of the World Trade Center is being accomplished with the services of more than a half dozen of the world's top architects and designers. The buildings, he said, are all state of the art and completely environmentally sustainable. A long-time supporter and leader of Israel Bonds, Silverstein described the securities as "a hell of an investment" benefitting a" forward-looking, innovative and miraculous nation." NYS Comptroller Thomas DiNapoli also spoke and, said he views Israel bonds as "a sound and secure investment that is a key part of the state's fixed income portfolio." NY has invested over $110 million in Israel bonds. NYC Comptroller Join Liu also attended, noting the city has acquired over $47 million in Israel bonds. Israel Bonds President and CEO Izzy Tapoohi said the excellent attendance at the event indicated the great interest of newer generations in Israel's economy and investment possibilities. Tapoohi also observed that Israel "which was given nothing in terms of natural resources, but everything in terms of human resources, has made an enormous difference throughout the world." The evening was chaired by New York City real estate personality, James Emden.